The giant metal pots in the kitchen of a drab Bogota cafeteria are filled with simple dishes like vegetable rice. But Edgary Granadillo's delicate arrangement of the plates he sets before rushed lunchtime office workers hints at the finer dishes he once served. The former executive chef at a beach resort in Venezuela once commanded a staff of 65 cooks and made regular appearances on television cooking shows. Now he is laboring for $10 a day, with one sole aim: to send money back home. "The wages there aren't enough," Granadillo, 30, said, his dark, somber eyes keeping a careful eye on a bubbling saucepan of fish head soup. "People need to rely on a Venezuelan outside the country, who can send something, in order to survive." As the number of Venezuelans fleeing their country's deepening economic and humanitarian crisis climbs, a burgeoning lifeline for those back home is emerging — remittances. Skirting strict currency controls, dozens of transfer operations, mostly small-scale businesses run by a handful of exiles entirely online, have opened abroad to help emigres convert their dollars and pesos into Venezuelan bolivars that arrive within minutes in a relative's Venezuelan bank account. The remittances are big business. Independent experts estimate Venezuelans now send at least $1 billion a year to friends and family members that they've left behind. 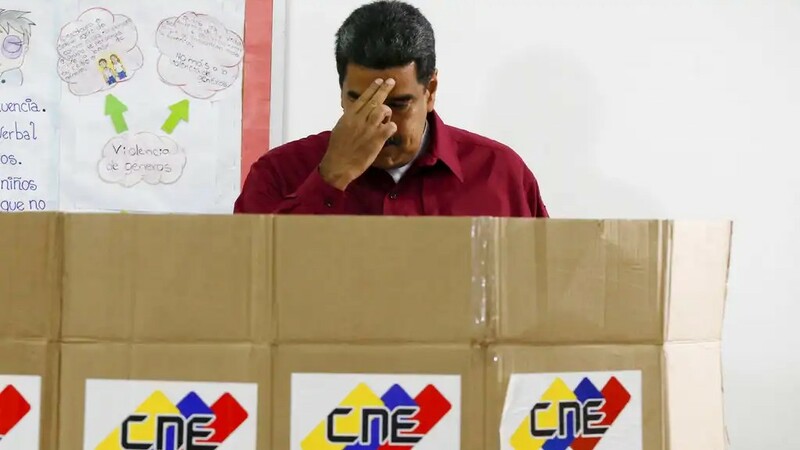 That money is critical at a time when Venezuela's minimum wage is now worth less than $2 a month, and the government of President Nicolas Maduro, who won a new six-year term Sunday in a contested vote many fear will spur even more people to leave, is taking note. Blaming the operations for feeding devaluation — and hoping to snag a piece of the pie — Venezuelan officials recently shut down several exchange houses and announced they would be opening their own. More than 100 people linked to remittance businesses have been detained in what officials dub "Operation Paper Hands." They are accused of speculating on the value of the bolivar by using the black-market exchange rate. The board of directors of Venezuela's top private bank, which held many of the remittance accounts, was arrested as part of the operation. 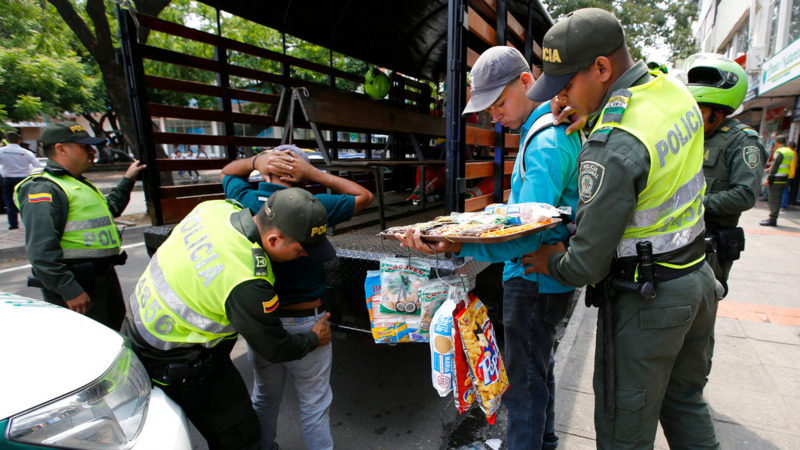 Venezuela's chief prosecutor, Tarek William Saab, has warned that "new detention centers should be built for this type of crime," which he said was causing "grave damage" to the nation's economy. He added that while many of the business operators might be working from outside the country, avoiding arrest, officials have identified accomplices within Venezuela. "They might be abroad playing with the pain of Venezuelans, but we know who they work with," he said. Most remittances sent to Latin America come from migrants in the U.S., who send money to Mexico, Cuba and other nations in Central America and the Caribbean. In 2016, those money transfers valued $74.3 billion — in some cases, contributing more than 10 percent of a nation's gross domestic product. Venezuela historically had been a receptor of migrants, and thus a country people sent remittances from, but that has changed. "The majority — 100 percent, and if not 100 percent, more than 99 percent — of Venezuelans who leave the country are doing so in order to send money back to relatives," said Yulia Torres, founder of an Instagram account called "Venezuelans in Bogota" that has attracted more than 40,000 followers. "They might not ask you for it, but they absolutely need it," she said of relatives back home. To keep their accounts flush with bolivars, money changers must wade into Venezuela's murky black market, where they sell dollars held in accounts abroad at 100 times the official rate, which only state agencies and privileged insiders have access to. At a typical transfer shop, Venezuelans who operate the business maintain personal bank accounts within Venezuela while opening new ones in foreign currencies abroad. 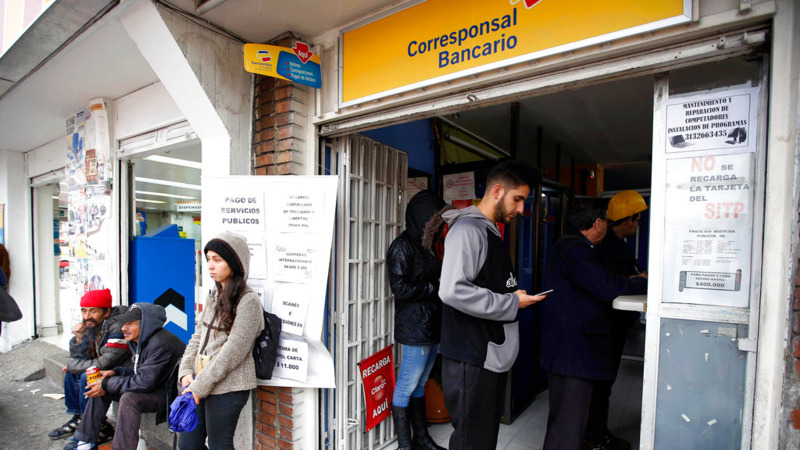 Migrants in Bogota, for example, deposit pesos into the business' Colombian bank account and the exchange operators transfer an equivalent amount of bolivars from their own Venezuelan account to that of the indicated relative. Ecoanalitica, a Venezuelan financial consulting firm, estimates about $1.1 billion in remittances were transferred to Venezuelans last year, a number analysts say could be higher given the difficulty in calculating informal transactions. Even on the lower end, that would mean upward of 4 million Venezuelans, or around 15 percent of the population, receive help from abroad. "Increasingly middle-class households need remittances in order to survive," said Jean Paul Leidenz, a senior economist at Ecoanalitica. "But we cannot just depend on remittances for hard currency income. Because they never enter the economy." 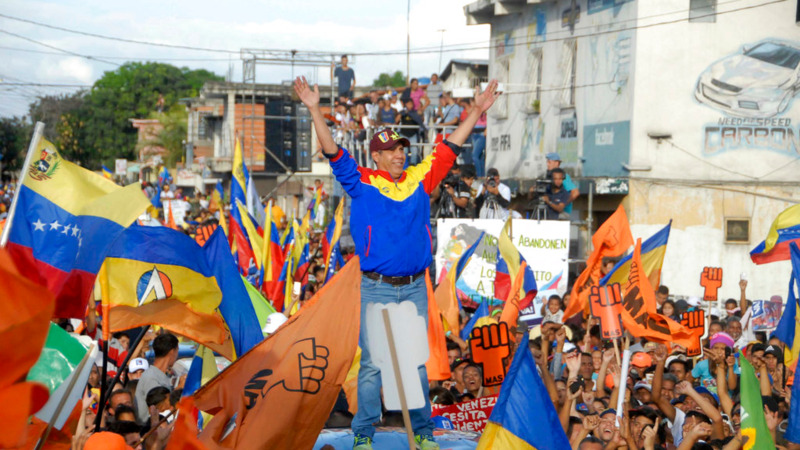 Maduro has repeatedly accused Colombian President Juan Manuel Santos of waging an economic war against Venezuela by allowing "mafias" to horde large quantities of bolivars. While large stockpiles of bolivars have been found as far away as Paraguay, suggesting networks are speculating on the currency's value, analysts say Venezuela's current economic turmoil is driven by poor government decisions, such as issuing new money much faster than there is anything available to spend it on. Venezuela imposed currency controls in 2003 aimed at halting capital flight, but most economists say they have actually been driving the current financial crisis. Individuals and businesses must apply to receive dollars at the government-set official rate to import goods and cover other transactions. But except for the public sector and a few privileged insiders, most Venezuelans must turn to the black market, where one dollar currently fetches about 100 times more bolivars than at the official rate. Using that rate, analysts say Venezuela's official exchange houses would never be able to compete. "We are a solution," said Victor Aguirre, who repaired roofs in Venezuela and opened an online exchange business with a friend a few months after arriving in Colombia. A Panama-based manager at Rapid Cambio, one of the businesses recently blacklisted by the government, likened the government's detentions to a "witch hunt." Speaking on condition of anonymity for fear of further reprisal, he said he plans to open a new business as soon as the dust settles. Like many migrants, Granadillo, the chef, makes barely enough money to cover his daily expenses. But in one day of working in Bogota he earns as much as he did in a month in Venezuela. The little he is able to send back doesn't go far, but his 62-year-old mother says she would go hungry without it. On a recent afternoon, Ana Teresa Rondon used the money Granadillo sent back to purchase a few peppers, an avocado and 3½ pounds of chicken that she said would need to last a month. "Without the remittance, I wouldn't be able to buy anything," she said.